Is your marketing not performing as well as it used to? Maybe you’ve never been able to see the returns that you were looking for? With ever-increasing competition in the digital space, marketing optimization has become a priority for a number of brands as they see less and less from their previously effective marketing investment. As such, we’ve created this guide to help you get your edge back. Marketing optimization doesn’t have to be complicated, so we’ve outlined 7 easy-to-implement ways that can increase the efficacy of your marketing without increasing your budget. Now, without further ado, let’s begin! More brands than ever are using paid digital marketing channels to advertise their products and services. In fact, a staggering 5 million advertisers are using the Facebook platform, with well over 4 million putting their budgets behind Google’s AdWords. While there are indeed more people online than ever, the number of advertisers is growing much faster than the number of people to advertise to. Simply put, it means that your costs are going to increase as more brands compete for the same audience’s attention. It also means that you have to approach your paid advertising more strategically than ever before. First of all, trying to reach everyone with your advertising has proven to be far less effective than a having a targeted focus to your marketing. Instead, work to be as specific as possible while maintaining a large enough audience. For example, Facebook gives you a meter to read as you select your various targeting criteria. If you so desired you could target women over 55 that are recently married, interested in garden gnomes, and live in Auckland NZ. While that may be a little too specific for many advertisers, the point is that it’s possible and you should be taking advantage of these features. Once you’ve selected an audience that fits the description of your ideal buyer, it’s important to create ad graphics and copy that is aimed at that specific audience. Your audience will be far more engaged with your ads if they’re interested in the creative they’re being shown. Don’t make the mistake of trying to create a one-size-fits-all ad or ad set that you display to multiple audiences. Instead, take the time to create new graphics and copy for each audience and for each new campaign you run. Pro Paid Marketing Optimization Bonus Tip: Create new ads (graphics and copy) regularly to keep your ads from getting stale and your audience from losing interest. Even ads that once performed well can lose their impact. Finally, avoid overlapping audiences (advertising to the same people) when running multiple campaigns as you’ll essentially be competing with yourself. That means creating entirely unique audiences for each and every campaign you run. People who already know your brand are far more likely to buy from you. These warm audiences are available to you via a simple tool called a pixel. Available from both Google AdWords and Facebook, these pixels allow you to track user behavior on your website and, in turn, market to these users based on their behavior. This way you can show ads to anyone who has visited your site or, for example, just those who have visited a specific product page. With the pixel you can show this audience ads for that specific product and only that product (and maybe even include a special offer). Retargeting has proven to be one of the most effective forms of paid advertising, but the intricacies of this powerful tactic are beyond the scope of this post. To kickstart your learning about retargeting, see these articles from Google AdWords and Facebook. People have always bought from brands they trust. As our society as a whole becomes increasingly averse to traditional advertising, this statement becomes more important than ever. One of the most impactful marketing optimization methods in this list focuses on generating this trust from your audience. User-generated content is any form of content created by your users or customers on the topic of your brand, product, or service. As you can imagine, the impact of real-world customers sharing their experience about your brand or product can have a major impact on a targeted audience of prospective buyers. For example, you could promote a compilation video on Facebook of real customer reviews that highlight your brand, or a customer-submitted photo of your product being used in a unique way or place on Instagram. User-generated content should be a single facet of your paid marketing optimization program. Use it to catch people’s attention to get them to click through to your site by advertising with a highly targeted audience. Then work to convert those who don’t buy the first time around with a sophisticated retargeting strategy. Like paid advertising, search marketing used to be a whole lot easier. As little as five years ago you could rank for a lot of search queries by simply posting 500-word blog posts twice a week. Compared to today, very little true search engine optimization was required. If you’re still publishing those 500-word blog posts they are no longer as effective at driving traffic as they were five years ago, and you need to make a change. We’ve outlined two powerful ways to support your search marketing optimization in the sections below. Search engine optimization is more complicated than it used to be, sure. But that doesn’t mean that it has to be hard. In fact, ranking your content is largely dependent on one thing. Providing value has always and will always be the number one focus of Google (and other search engines). You can score a lot of points with the search engines if you can prove that your content provides their audience with the value they’re seeking. In fact, most of the metrics Google tracks to determine whether or not to rank your content tie back to providing value. For example, Google considers time on page (TOP, or the amount of time someone stays reading your content) a very important metric. Because the more time your readers spend on the page, the more likely they are to have found it valuable enough to continue consuming. If the content was not valuable, readers would likely click back after a few seconds. See how that works? While the full scope of SEO and search marketing optimization will take some time to master, the basics are pretty straightforward and can have a dramatic impact on your content’s performance. One of the best ways to provide value to your reader is to focus on writing for the unique audience you’re targeting. Write to address their unique pain points and speak the language they speak. The best way to do so is by creating buyer personas. Personas are semi-fictitious representations of your ideal buyer. For more on creating effective buyer personas, see this template from HubSpot. Writing on topics that you think your audience wants to read will only get you so far. To define the topics you need to be writing about, start by listing all of the potential questions your buyers face before purchasing your product. These questions will be specific to your personas, but they’ll all tie back to helping them solve a problem with your product or service. Be sure to document this list of questions as a part of your search marketing optimization strategy. If you’re like most brands, keyword research may be the area where your search marketing suffers the most. It’s important to write for a particular keyword related to the topic of your article and the search query your reader inputs into Google. Keywords are words that Google uses to help understand what your content is about. If you don’t structure your article around keywords that you know people are searching for, you’re writing without knowing whether or not your article will actually drive any traffic. Even if you’re doing it, it’s important to make sure you’re doing it right. Paid tools like Ahrefs and Semrush can help you to determine a keyword’s monthly search volume and the competition you’ll face when attempting to rank for that keyword. Free tools like Google Keyword Planner can help you if you’re not ready to make the investment in these powerful tools. Search volume is the number of times (on average) a particular word or phrase is searched for each month. Rather than making assumptions about search volume, be sure to use a tool to help you avoid writing for keywords that don’t actually get searched for. With over 2 million blog posts being published every day, you can bet you’ll face some tough competition for many of the most popular words you want to write for. That’s where tools like the ones mentioned above come in handy. Each have a keyword difficulty score that will help you to determine how hard it will be to rank for a particular keyword. Search Marketing Optimization Pro Tip: Focus on using 1-2 long-tail keywords (multiple word phrases) throughout your copy, as they’ll be more specific to user queries related to your business. Broad-term keywords may drive a lot of traffic, but most of it won’t be looking for what you’re selling. Once again, length ties into the perceived value of your article. Longer posts are more likely to contain more valuable information and be more important to searchers. A rule of thumb to give your content a fighting chance is to write a longer post than the articles that currently rank on Google’s first page for your keyword. Rather than focusing purely on word count, aim to include more variety and information than the other posts as well. A more comprehensive post is a more valuable post. Images help to break up long blocks of text and provide a lot of value to your readers. Use images, graphs, charts, and other visual aids to support your text. In fact, a recent Cornell study found that readers were 29% more likely to believe the claims made in an article if they were supported by a graph. They don’t need to be complicated, they just need to provide an accurate visual representation of your data. When you go to publish your post, it’s important to give Google as much information about it as possible to help it decide who to show it to. Nearly every publishing platform lets you edit your metadata. Search Marketing Optimization Pro Tip: WordPress plugins like Yoast help make editing metadata easy. The information included above will give you a massive head start to successful SEO, but it’s vital that you continue to learn how to optimize your posts even further. Don’t miss great resources from SEO masters like Brian Dean and Neil Patel. Technical SEO can get complicated. Luckily, there are tons of great tools that exist to help make it easier. This search marketing optimization idea is pretty straightforward. Whether your budget is minimal and you need to use free tools like Google’s test my site, or you have the resources to pay for more dynamic tools like Deep Crawl. The point is to put them to use. In fact, don’t limit yourself to tools related to SEO. New tools that will support your digital marketing optimization efforts are released every day, and it’s these tools that can help automate more complicated processes and give you an edge over your competition. Email is still the most effective way to reach your audience. In fact, email is 40 times more effective at acquiring new customers than Facebook or Twitter. That said, effective email marketing needs to be done right to see these kinds of results. If your email is underperforming, be sure to read the following email marketing optimization ideas carefully! The first idea ties back into what we learned about SEO—that providing value should be the number one priority. Rather than simply working to stay in touch with your list, do your best to provide as much value as possible with every communication. That means that you should be sending over links to your most valuable blog posts and downloadable guides rather than simply trying to make a sale every time they hear from you. This type of valuable content keeps your list engaged and can help to build trust, establish your industry expertise, and nurture your leads toward a conversion over time. Sure, some of the value you provide can come from coupons and discount codes, but mix it up! Remember user-generated content from the paid marketing section above? Email is another great place to use UGC, as it can help support the trust-building process and make your email marketing more effective. Test including different types of UGC in different emails to see what your audience responds to best. As with all marketing, the most important way to continually advance your marketing optimization process is to test new ideas regularly. When you find a tactic that works, put your budget behind it to scale it and take advantage of your newfound opportunity. For more creative ways to use user-generated content in your marketing, be sure to check out our blog. 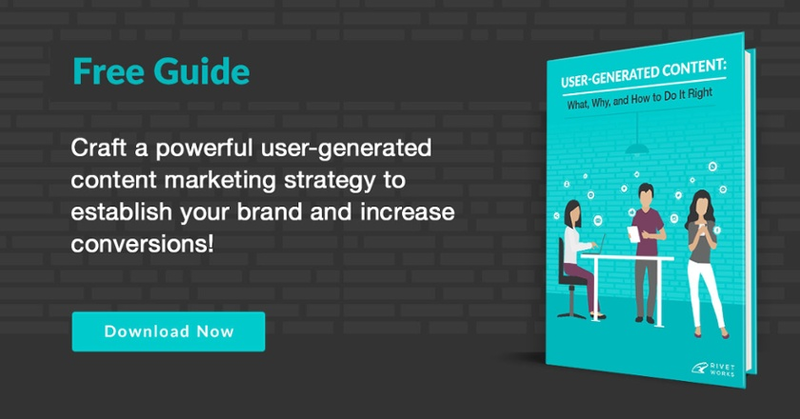 It’s full of great UGC marketing ideas and examples of how other brands are using it most effectively.